Synopsis : List of major awareness dates and commemorative observance days weeks and months that focus on health medical and disability research or ethical causes of importance. A national or international awareness day, week, or month is a date usually set by a major organization or government to commemorate a medical research or ethical cause of importance on a national or international level. Throughout the year organizations support a variety of initiatives to raise awareness and understanding for key health issues around the world. Awareness days, weeks and months engage the public in important health information. Usually awareness dates are health related, and help raise awareness of health conditions, medical illnesses, cancer types etc. Often based around these dates many charities collect money in the form of donations and fund raising. There are also other organizations and foundations around the world that declare both national and international observances, although these are not always as widely recognized. We hope this calendar will be of use to teachers, organizations, and persons seeking forward planning resources, launch dates, events, and charity donation campaigns, across a wide range of categories and event types. Awareness ribbons have also become popular symbols of causes and illness conditions over recent years. Like awareness bracelets the use of various colored folded ribbons is designed to create public awareness to health, medical conditions, disability, and other issues. We currently have over 80 different ribbon colors and designs listed that denote awareness for hundreds of conditions. 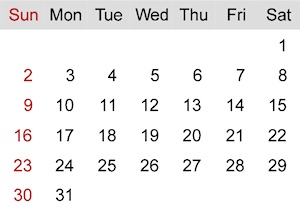 Calendar page showing days and dates. April 11 - Parkinson's Disease International. Last Saturday in April - Show Your Mettle Day - to encourage amputees to show their metal (prosthetic devices, wheel chairs, etc). April 6-13 (2019) - National Porphyria Awareness Week (NPAW) to enhance porphyria awareness in communities by spreading the word about porphyria. May 27 - World Multiple Sclerosis (MS). June 23 - Dravet Syndrome. Note: If you know of a discrepancy, or other recognized awareness programs and dates you would like to see added to the list, please Contact us with as many details as you can provide so we can list the date(s) in our observance calendar.